Here’s a seven minute story about WNS, focusing mostly on Oregon caves and bats. Bad news. The WNS fungus was recently discovered on a bat in an Indiana cave. Researchers doing biennial bat counts at Endless Cave in Washington County discovered two little brown bats on Jan. 23 that exhibited the white fungus characteristic of WNS. One of the bats was euthanized and sent to the U.S. Geological Survey’s National Wildlife Health Center in Madison, Wisconsin, which later confirmed the presence of the WNS-associated fungus. Additional bats with signs of WNS were discovered during routine bat count surveys at other caves, so expect more reports. Winter bat inventories in Alabama are scheduled to begin on or around February 15 and go through mid-March. Check back soon for updates on WNS in Alabama. Hopefully it won’t arrive this year! It is difficult to imagine that an entire species, whose numbers are historically very large, could actually disappear. It is even more difficult, but equally unpleasant, to imagine how their disappearance might change an entire ecosystem. The sky at dusk used to be filled with those predators, each one eating its body weight in insects nightly. Without them, the balance of nature will be changed, with potentially significant impact on agriculture and forestry, which have always depended — almost without knowing it — on the role of insectivorous bats. Here’s an article published in the Birmingham News about Alabama bats and the threat from WNS. The article features our state’s non-game wildlife biologist Keith Hudson.If you want to witness the awe-inspiring bat flight from Sauta Cave in north Alabama, you should go soon. As Keith says, this may be the last year we will be able to witness the spectacular bat flight. 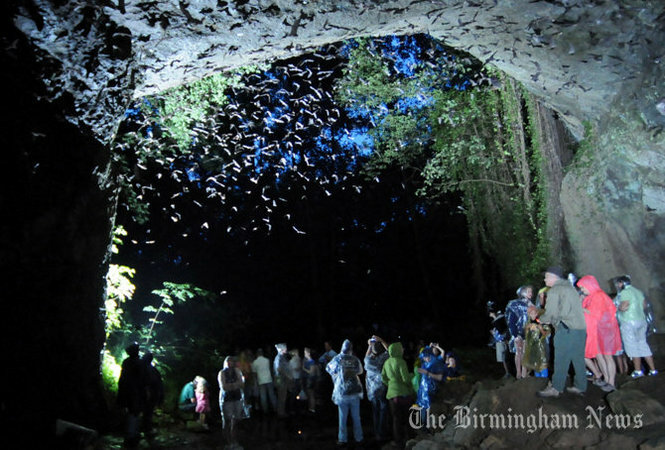 The nightly emergence — the largest of its kind east of the Mississippi River — provoked a successions of “Wow!” and “Oh, my gosh!” exclamations from the 200 witnesses on hand to hear from Keith Hudson, a wildlife biologist and bat expert with the Alabama Department of Conservation and Natural Resources. This year, though, that sense of wonder is mingled with the dread of impending loss, as a bat-killing fungus called white-nose syndrome spreads south and threatens the Alabama caves where gray bats are concentrated. Here’s an article about White Nose Syndrome moving closer to Alabama. Biologists fear a disease that has sickened bats from Tennessee to New York could make its way to north Alabama within a year. White-nose syndrome, a fungal disease that is typically fatal to bats, has been found in northeast Tennessee. In recent years, the disease has moved south about 175 miles each summer, which could put it in northeast Alabama as early as next winter. The article highlights one way the public can help. Wheeler Wildlife Refuge Association, a nonprofit organization affiliated with Wheeler Wildlife Refuge, is collecting donations to help pay for white-nose syndrome research in Alabama. Donations can be mailed to the organization at P.O. Box 239, Decatur, AL 35602. Just include “WNS” on your check and your donation will be used for WNS research in Alabama. A fungus has killed off about 90 percent of the state’s bat population, according to scientists who recently conducted a count of hibernating bats. The devastation was shocking in the largest hibernation spot for bats in New Jersey – Morris County’s Hibernia Mine. As many as 30,000 bats normally spend the winter, but a recent count found only about 1,700 alive – and many of those showed signs of infection, said Mick Valent, principal zoologist with the state’s Endangered and Non-game Species Program. You are currently browsing the archives for the WNS article category.